There are a few different types of bats and flying foxes in Australia. Bats are an interesting group of Australian animals. They are the only flying mammals - and this is how they got to Australia. Australia’s original mammals were only marsupials. Bats are placental animals, but because they came to Australia by themselves (i. e. they were not brought here by humans), they are considered to be Australian native animals. There are almost 80 species of bats in Australia and they represent about 20% of Australia’s native mammals. Two thirds are found in tropical north, in the climate similar to their origins. Bats are further classified as megabats and microbats. The most obvious difference is their size, but there are others such as feeding, social system and ways of navigation. Most megabats are large, but there are smaller ones such as blossom bats which are only up to 60mm long. What is common in the group of megabats is that they don’t use echolocation for navigation as do microbats. Megabats use their eyesight which is why they’ve all got large eyes while the eyes of microbats are tiny. Because using echolocation is what bats are famous for, Australians say that megabats are not real bats – and they call (most of) them flying foxes. Flying foxes live in large colonies. They eat fruit, flowers and nectar and they are important pollinators of trees. They migrate from their roosting sites where they sleep during the day, to their feeding sites every day at sunset, eat during the night, and at sunrise they fly back to their roosting sites to sleep the whole day. Flying foxes are some of the smartest animals and they have complex communication and social structure. During the breeding season there can be hundreds of thousands flying foxes in their colonies and being so many, they damage trees. Flying foxes also carry viruses that can be harmful to humans and they should not be touched. A newborn flying fox cannot fly and clings to its mother during the first month of its life. Once it’s strong enough to hang off the tree and roost, it is left to the roosting site while its mother goes feeding night time. By two months of age it has learned to fly but starts the daily migration to feeding site once it’s about three months old. There are four species of flying foxes amongst Australian animals. Black Flying Fox (Pteropus alecto) is found along the northern coast of Australia, from Sydney in the east to Shark Bay in the west. It lives in mangroves, rainforests and paperbark swamps. It has got a short black fur and a reddish collar on the back of its neck. It is a large bat, weighing up to 700g and it has a wingspan greater than 1m. Spectacled Flying Fox (Pteropus conspicillatus) can weigh up to 850g. It is dark brown or black and has a yellow ring around the neck. It is found only along the coast of north Queensland, from Mackay in the south to the tip of Cape York in the north. It lives in mangroves, rainforests and paprebark swamps and it feeds in pairs. Spectacled flying fox is thought to be an important long-distance spreader of seeds of rainforest trees. Spectacled Flying Fox is considered a vulnerable species. Grey-headed Flying Fox (Pteropus poliocephalus) is found along the eastern and southern coast of Australia, between Cairns in the north and Victoria – South Australia border in the south. It roosts in forests and mangroves, and feeds on blossoms and fruit in groups up to 10. It has got a shaggy fur, dark brown on the back, and grey on the face and belly. Around the neck, it has a reddish yellow ring. It can weigh up to 1000g and its wingspan can be longer than 1m. Grey-headed Flying Fox is a vulnerable species. Little Red Flying Fox (Pteropus scapulatus) is the most common and widespread of Australian megabats. It is found in most of New South Wales, Queensland and Northern Territory, and in northern parts of Victoria and Western Australia. It is also the smallest of flying foxes, weighing up to 600g and having a wingspan less than 1m. It is reddish brown with wings that look translucent when it is flying. It lives in forests, woodland and mangroves, and eats eucalypt flowers, leaves, sap, bark and insects. Some good places to watch flying foxes are Daintree National Park in far north Queensland and Kakadu National Park in Northern Territory. There are two more species of megabats in Australia, but they are not called flying foxes. Both are small. 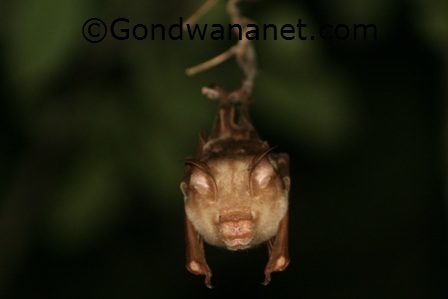 Eastern Tube Nosed Bat (Nyctimene robinsoni) weighs up to 50g, has a grey fur, brown wings with yellow dots, and tubular nostrils. It roosts alone in rainforests or eucalypt forests and eats fruits and blossoms. It is found along the eastern coast of Australia between Byron Bay in New South Wales and the tip of Cape York in north Queensland. Common Blossom Bat (Syconycteris australis) is the smallest megabat – it weighs 26g. It is a reddish brown bat that roosts alone in dense vegetation in rainforest, eucalypt forest and heathland, where it eats nectar. 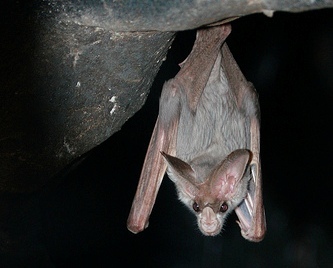 Like the Eastern Tube Nosed Bat, it is found along Australia’s eastern coast, but its distribution extends a bit further south – between Cape York in the north and Newcastle in the south. As in some other groups of Australian animals (e. g. marsupials), in bats the larger species are herbivores and the smaller ones are carnivores. Microbats are nocturnal predators and live either alone or in groups but they don’t hang off trees. During the day they roost in caves, tree hollows, tunnels, or abandoned mines. Microbats’ eyes are very small. They don’t rely on eyesight for finding their prey, instead they send out sound pulses between 5 and 200 kHz and pick them up with their large ears as they bounce back, telling the bat the location, size and moving speed and direction of its prey. Microbats need a lot of energy to fly and to replace the body heat that goes out through the large wing and ear surfaces. A microbat can eat 50% of its body weight every night. But during the winter the food is scarce and some species of microbats migrate, others hibernate. Good places to see microbats are Jenolan Caves in New South Wales, Undara Lava Tubes in Queensland, Litchfield National Park in Northern Territory, and Tunnel Creek National Park in Western Australia. Ghost Bat (Macroderma gigas) is Australia’s largest microbat. It weighs up to 165g, has a large grey body, and large eyes and ears. It roosts in caves and crevices and eats insects, frogs, reptiles, birds and small mammals. It’s found in most of north and inland Queensland, as well as the Top End of Northern Territory. 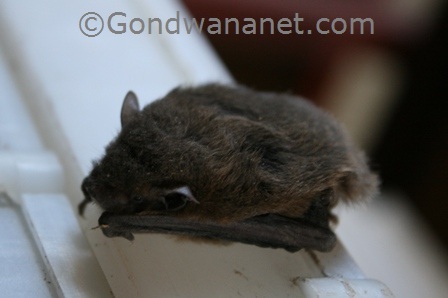 Diadem Leafnosed Bat (Hipposideros diadema) is a grey to yellowish brown bat that weighs max 50g. It has got dark legs, tiny eyes and pointed ears, and it eats insects. It is found in the Top End of Northern Territory, and on the Cape York peninsula in far north Queensland, where it lives in rainforests and eucalypt forests. It roosts in caves, mines and tree hollows. Orange Leafnosed Bat (Rhinonicteris aurantius) is a brownish orange bat with dark brown wings and reddish limbs. It weighs max 10g and it eats moths, beetles and other insects. It is found in the Top End of Northern Territory and the Kimberley in Western Australia, where it lives in open woodland. It roosts in warm and humid caves in large groups up to many thousand individuals. Common Sheathtail Bat (Taphozous georgianus) is a dark brown bat with ridged ears and long narrow wings and it weighs up to 50g. It is found across northern Australia, except Cape York peninsula in Queensland. It lives in rocky country and roosts in caves, cervices and abandoned mines. It feeds in flight (as opposed to some other, larger microbats) and flies in a zigzag pattern when hunting. 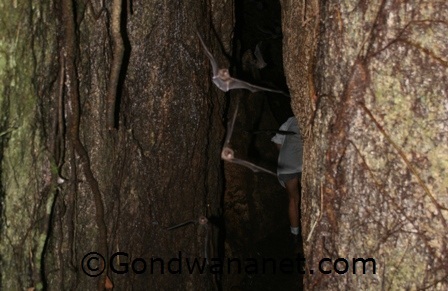 It likes to cling to rock walls instead of hanging off cave ceilings as do most of other microbats. Large Footed Myotis (Myotis macropus) is a greyish brown bat with large feet which are enclosed in its membrane. It can weigh up to 12g and it roosts in groups in caves, mines, tunnels and buildings. It specialises in aquatic insects and is often seen to fly near water surface and dip down to catch them. It is found close to water bodies on the coastal areas around eastern and northern Australia, between Mount Gambier in South Australia and Broome in northern WA. Hoary Wattled Bat (Chalinolobus nigrogriseus) is a small bat that weighs max 10g, has a blackish grey fur and a rounded forehead. It catches insects in the air and on the ground, and roosts in cervices and tree hollows. It lives in forest and woodland along the eastern and northern coast of Australia, between Byron Bay in New South Wales and Broome in Western Australia.